So, I guess I am starting yet another series of articles; this time coming around whenever my mail order supplier decides I have a big enough pile of comics on my pull list to pack up and ship out to me, so the books reviewed can be up two months old. These aren’t fandom-produced comics, but they obviously contain some sort of anthropomorphic animal. 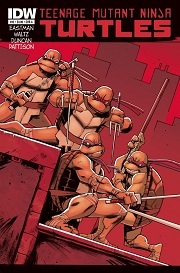 This issue marks the end of the first year of the most recent reboot of the Teenage Mutant Ninja Turtles. For those keeping track at home, there have been two previous comic book continuities, two cartoon series, one live action TV series and a movie franchise. In this reboot character creator Kevin Eastman, along with scripter Tom Waltz, seems to be picking and choosing bits and pieces from the characters’ past. This issue marks the first confrontation to the teenagers with their iconic villain, Shredder. The conflict is short and inconclusive; this is only their first meeting in this continuity, after all. The fight is just a distraction so the turtles can rescue the kidnapped Splinter, who also challenges the Shredder, and does not fare well. The turtles also briefly fight and subdue new for this continuity furry mutant Alopex, an Arctic fox vixen baddie. Her battle record at this point is pretty unimpressive; Splinter cold-cocked her last issue. She should probably worry about permanent brain damage at this point. I am not much of a reviewer of comic book art, so I’ll just say Dan Duncan’s pencils are alright and leave it at that. They do not wow me, but I do not dislike them either. Hopefully, I do not have to lean on the Ninja Turtles so much in the future, but my shipment was pretty furry-sparse last time. 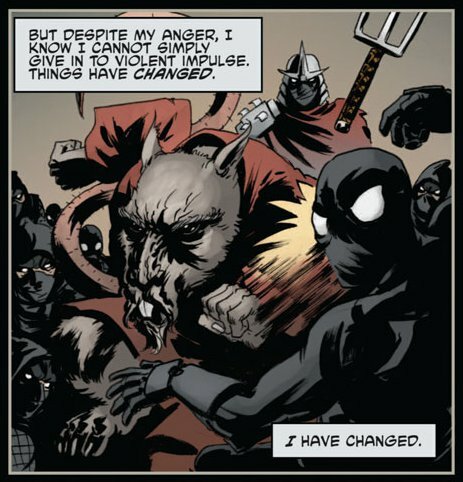 This side series previously featured different artists and writers taking on each of the four titular turtles, but IDW apparently decided to keep the ball rolling with Splinter, with a script by Erik Burnham and pencils by Charles Paul Wilson III. 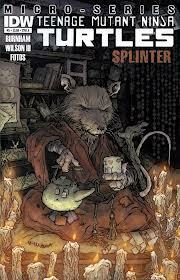 This issue explores the unique twist on the origin story of the turtles and their rodent sensei Splinter in this universe. Though they have always been “brothers” and Splinter has always been their “father,” in this version, Splinter is actually the reincarnated soul of a ninja from feudal Japan reborn in the form of a rat, whose four sons were reincarnated as turtles, before the whole lot of them were mutated in a completely unrelated science experiment. Make sense? The upshot is that, unfortunately, most of the action takes place in the past, so not as much furry as promised by a Teenage Mutant Ninja Turtles comic. I warned you it was a furry-light shipment. 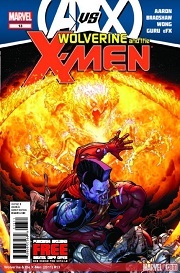 However, despite Wolverine and the X-Men appearing in the series’ title and this issue being a crossover with the Avengers vs. X-Men event, this fairly standalone issue highlights sideline character Warbird, a member of the Shi’ar race of aliens evolved from birds. If the Na’vi can count as furry, Warbird can, because she’s the best I’ve got on short notice. For reasons that are better explained by the issue’s recap page than here, Warbird finds herself fighting the X-Men, despite living with them for approximately a year. During the fight, she flashes back to her Shi’ar training to become a Warbird. It begins with a funny reversal on a famous scene from Watchmen, and ends with a genuine tearjerker as Warbird remembers that innocence is always the first casualty of war. Amazing job by writer Jason Aaron. This is the first monthly superhero comic to actually make me cry. Nick Bradshaw’s art is nice, but not the reason to read this book. Highly recommended. The only Teenage Mutant Ninja Turtles comics worth reading are the original Eastman and Laird issues; the only Wolverine comics worth reading are those from the same period (mid-80s, the first Frank Miller miniseries I guess), before Marvel overinflated his powers and attitude to the ridiculous point where, nowadays, he can take on characters like Thor and Mephisto.